Kochira Katsushika-ku Kameari Kōen Mae Hashutsujo (こちら葛飾区亀有公園前派出所, lit. "This is the Police Station in Front of Kameari Park in Katsushika Ward"), often shortened to KochiKame (こち亀), is a Japanese comedy manga series written and illustrated by Osamu Akimoto. It takes place in the present day, in and around a neighborhood police station (kōban) in the downtown part of Tokyo, and revolves around the misadventures of middle-aged cop Kankichi Ryotsu. The official English title is KochiKame: Tokyo Beat Cops. Kochira Katsushika-ku Kameari Kōen-mae Hashutsujo: The Movie 2: UFO Shūrai! Tornado Daisakusen!! It was continuously serialized in Weekly Shōnen Jump for 40 years, from September 1976 to September 2016. Its 1,960 chapters were collected into 200 tankōbon volumes, making it the manga series with the highest number of volumes. The manga has been adapted into an anime television series, produced by Studio Gallop and broadcast in Japan by Fuji TV, three theatrical animated films (by Tatsunoko and Gallop, respectively), two live-action movies, several stage adaptations, and a live-action television series. As of 2014, the series had sold over 157 million tankōbon copies, making KochiKame one of the best-selling manga series in history. In 2005, TV Asahi named the anime number 36 on its list of the Top 100 Anime. The series was awarded a Guinness World Record for "Most volumes published for a single manga series." The typical KochiKame plot involves Kankichi "Ryo-san" Ryotsu coming up with a money-making scheme by inventing a new gadget or capitalizing on a fad, achieving great success, calling on Keiichi Nakagawa's help as things turn sour, and finally losing it all as the fad runs out of steam or out of control. While the plots are gag-driven, much of the humor comes from the combination of mundane characters with those that are bizarrely out of place; such as Nakagawa who has wealth and Ai Asato who is a transsexual. What they have in common is everyone's lack of actual police work, most of which is never explained or rationalized in the slightest. (It is explained in Jump that Ryo-san is one of the best officers at catching criminals.) Nakagawa and Reiko Akimoto have special licenses (such as for wearing personal clothes instead of uniforms to work) from police headquarters because of their skills in linguistics. The plot consistently evolved with the times and most of the main characters do not really age, despite the fact that the series started in the 1970s and is later clearly set in the 2010s. However, some characters do age, like the grandchild of Buchao, who was a baby in the early books, but is now close to junior high, which the author has self-mocked in a few "look back" episodes. KochiKame has a broad audience, ranging from adolescent boys to middle-aged salarymen. Much like Homer Simpson, Ryo-san's antics appeal to children who can laugh at an old buffoon, and to men fearing that they are becoming old buffoons themselves—and also because it often subtly mocks the latest fads and trends. The stories are generally innocent in content, and what little violence appears is comical, while the occasional risqué subjects are included strictly for laughs rather than to titillate. In another parallel to The Simpsons, KochiKame's immense popularity has led to guest appearances in the strip by real-life Japanese celebrities such as Tetsuya Komuro. For creator Osamu Akimoto, KochiKame is an homage to the working-class people and districts of old Tokyo, and most episodes open with an elaborate full-page illustration of a Shitamachi (downtown) street scene, typically with old wooden buildings and boys playing in the streets. Written and illustrated by Osamu Akimoto, Kochira Katsushika-ku Kameari Kōen Mae Hashutsujo was continuously serialized in Weekly Shōnen Jump since September 21, 1976. Akimoto debuted the series under the pen name of "Tatsuhiko Yamadome", but changed to using his real name in 1978, when it reached its 100th chapter. Periodically the chapters were collected into tankōbon volumes by publisher Shueisha, the first released on July 9, 1977. The series ended on September 17, 2016 in the 42nd issue of the year, in commemoration of KochiKame's 40th anniversary (the issue being published four days before the anniversary proper). Its 200th and final tankōbon volume was published on the same day. Shueisha reprinted the issue that included the final chapter on December 31, 2016, marking the first time a Weekly Shōnen Jump issue has ever been reprinted. Akimoto created a new chapter of Kochikame for the 42nd issue of Weekly Shōnen Jump on September 16, 2017. In 2017, a sequel manga created by Akimoto began in Ultra Jump. Titled Ii Yu Da Ne! (いいゆだね! 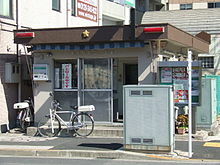 ), it is set in a bath house next to a police station in Shitamachi, Tokyo. Since KochiKame's inception in Jump in 1976, the series was not adapted into anime often, most likely because it would have been more suited for a live-action adaptation. The closest it could get when being adapted into anime was either in the form of commercials for certain products sold in Japan such as toys and snack foods as early as 1980, and a 30-minute animated film produced by Tatsunoko Production which was shown alongside an animated adaptation of Izumi Matsumoto's Kimagure Orange Road (another popular Jump manga from 1984) produced by Studio Pierrot at a Shonen Jump Anime Festival hosted by Shueisha in 1985. It was directed by Hiroshi Sasagawa, who, at the time, was renowned for his directorial work on Tatsunoko's other works such as Speed Racer and the Time Bokan franchise. It was issued on home video by Shueisha under the Jump Video imprint as a prize for winners of a contest that took place in several issues of Weekly Shonen Jump for the magazine's 20th anniversary in 1988. However, to this day only small images of footage from the film can be seen on the internet since the film was not released broadly. An anime television adaptation of KochiKame finally began airing on Fuji Television on June 16, 1996. Produced by Studio Gallop, it ran for eight years and 373 episodes before ending on December 19, 2004. Two animated theatrical films were also produced; Kochira Katsushika-ku Kameari Kōen-mae Hashutsujo: The Movie (こちら葛飾区亀有公園前派出所 THE MOVIE) on December 23, 1999, and Kochira Katsushika-ku Kameari Kōen-mae Hashutsujo: The Movie 2: UFO Shūrai! Tornado Daisakusen!! (こちら葛飾区亀有公園前派出所 THE MOVIE2 UFO襲来! トルネード大作戦!!) on December 20, 2003. On September 18, 2016, an hour-long special by Studio Gallop aired on Fuji TV for the manga's 40th anniversary. Kochira Katsushika-ku Kameari Kōen-mae Hashutsujo The Final: Kankichi Ryotsu's Last Day (こちら葛飾区亀有公園前派出所 THE FINAL 両津勘吉 最後の日) features several voice actors reprising their roles from the previous series, as well as director Akira Shigeno. In 2006, a dubbed Hindi version of KochiKame began airing on Hungama TV in India. KochiKame has also had live-action film, a TV drama and stage adaptations. The movie was directed by Kazuhiko Yamaguchi, starred Mitsuo Senda as Ryo-san and was released in 1977. A live-action TV series starring Katori Shingo as Ryo-san began airing on TBS on August 1, 2009. A second live-action movie, based on this TV series and titled KochiKame - The Movie: Save The Kachidiki Bridge!, opened in Japan on August 6, 2011. Another play adaptation opened in September 2016 for the series' 40th anniversary and, like the others, it was directed, written by and stars Lasar Ishii as Ryo-san, who is also the voice actor for the character in anime adaptations. As part of its 40th anniversary celebration, the series received a 6-part crossover anthology novel with various characters from other series on September 17, 2016. Titled Vs. Kochira Katsushika-ku Kameari Kōen-mae Hashutsujo: Novelization Anthology (VS.こち亀 こちら葛飾区亀有公園前派出所ノベライズアンソロジー), the other series are Girls und Panzer, Osomatsu-san, Haruchika, Cheer Boys! !, Sorcerous Stabber Orphen and Nazotoki wa Dinner no Ato de. Ryotsu appears playable in the Weekly Shōnen Jump crossover fighting video games Jump Super Stars, Jump Ultimate Stars and J-Stars Victory VS. Other characters from the series appear in a non-playable capacity. J-Stars Victory VS.'s North American and European release (as J-Stars Victory VS.+) marks the first official release of Kochira Katsushika-ku Kameari Kōen-mae Hashutsujo material in English-speaking territories. In addition, various toys and collectibles have been created, including some items that first appeared in the manga as creations of Ryo-san. In commemoration of the 30th anniversary of Kochira Katsushika-ku Kameari Kōen Mae Hashutsujo's serialization, several special events were held. Separate one-shots of the series were published in thirteen different Shueisha magazines between August and October 2006. As of 2014, Kochira Katsushika-ku Kameari Kōen-mae Hashutsujo had sold over 157 million tankōbon copies, making it one of the best-selling manga series in history. Upon ending in 2016, the series was awarded a Guinness World Record for "Most volumes published for a single manga series" with 200. Akimoto received the Special Prize at the 21st Tezuka Osamu Cultural Prize for the manga in 2017. Kochikame won the 2017 Seiun Award for Best Comic. In 2005, TV Asahi named the anime number 36 on its list of the Top 100 Anime. Mike Toole of Anime News Network included Kochira Katsushika-ku Kameari Kōen-mae Hashutsujo: The Movie at number 56 on The Other 100 Best Anime Movies of All Time, a list of "lesser-known, lesser-loved classics." He called it "Kochikame at its best, a zippy combination of daffy comedy and solid action set pieces," with one of the funniest false endings ever. ^ a b "Osamu Akimoto's Kochikame Manga Ends on September 17 After 40 Years of Serialization". Anime News Network. 2016-09-03. Retrieved 2016-09-03. ^ "TV programs (by genre)". Nihon Ad Systems. Retrieved 5 September 2018. ^ "KochiKame Tokyo Beat Cops". European Union Intellectual Property Office. Retrieved 5 September 2018. ^ "Thirty Years of Gags". Web-Japan.org. 2006-09-04. Retrieved 2009-07-07. ^ "Celebrating its 30th Anniversary, Interview with the Artist of Kochi-Kame". Comipress. 2006-09-19. Retrieved 2009-07-07. ^ McCarthy, Jonathan Clements, Helen (2007). The anime encyclopedia : a guide to Japanese animation since 1917 (Rev. & expanded ed.). Berkeley, Calif.: Stone Bridge Press. p. 867. ISBN 1933330104. ^ こちら葛飾区亀有公園前派出所 1 (in Japanese). Shueisha. Archived from the original on 2011-07-06. Retrieved 2014-03-13. ^ "Weekly Shonen Jump Gets First Ever Reprint Thanks to KochiKame". Anime News Network. 2016-11-06. Retrieved 2016-11-06. ^ "Kochikame Manga Gets New Chapter in Shonen Jump". Anime News Network. 2017-09-10. Retrieved 2019-01-27. ^ "KochiKame's Osamu Akimoto Publishes 4 New Manga in 2017". Anime News Network. 2016-09-15. Retrieved 2016-09-15. ^ "KochiKame TV Anime Is 1-Hour Special Premiering September 18". Anime News Network. 2016-08-09. Retrieved 2016-08-09. ^ "Kids' channels line up hot fanfare as summer beckons". IndianTelevision.com. 2006-03-25. ^ a b "Manga-Based Live-Action Kochikame Comedy Gets Film". Anime News Network. 2010-08-08. Retrieved 2014-03-13. ^ "Kochikame, Shōjo Manga Get Live-Action TV Dramas". Anime News Network. 2009-05-28. Retrieved 2014-03-13. ^ ""KochiKame" Stage Play Presents an Explosive Main Visual". Crunchyroll. 2016-05-23. Retrieved 2016-09-15. ^ "Kochikame Manga Gets Novel Crossovers With Girls Und Panzer, Cheer Boys!, Mr. Osomatsu". Anime News Network. 2016-07-27. Retrieved 2016-09-15. ^ "Local communities erect manga/anime statues with tourists in mind". Asahi Shimbun. January 19, 2015. Archived from the original on January 23, 2015. Retrieved January 29, 2015. ^ "Kochikame Comedy Manga to Appear in 13 Magazines". Anime News Network. 2011-07-06. Retrieved 2014-03-13. ^ "Kochikame Earns Guinness World Record For Most Volumes Published For Single Manga Series". Anime News Network. September 11, 2016. Retrieved September 11, 2016. ^ "Hana ni Somu Manga Wins 21st Tezuka Osamu Cultural Prize's Top Award". Anime News Network. Retrieved 16 May 2017. ^ "Shin Godzilla Film, Kochikame Manga Win Seiun Awards". Anime News Network. Retrieved 2019-01-27. ^ "TV Asahi Top 100 Anime". Anime News Network. 2005-09-27. Retrieved 2014-03-13. ^ "The Other 100 Best Anime Movies of All Time, Part 2 - The Mike Toole Show". Anime News Network. 2017-04-02. Retrieved 2017-04-02. Wikimedia Commons has media related to Kochikame.